Humans are hard-wired to be overconfident in their decision-making abilities, an evolutionary feature that allows us to instantaneously and comfortably make decisions and avoid the halting (and in the distant-past of human history, life-threatening) paralysis that would result from constant self-doubt. People therefore have a hard time internalizing the idea that their preferences can be anything but coherent and consistent. Thus it comes as no surprise that, despite all the experimental evidence compiled to the contrary, rational agent theory persists as a cornerstone of microeconomic theory, underpinning many policies in our society. 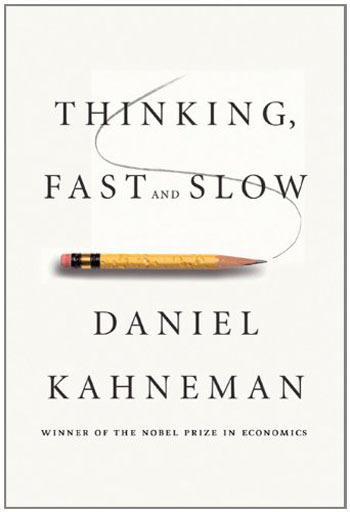 In Thinking, Fast and Slow, Daniel Kahneman shatters its validity and warns against the societal implications that this understanding of human decision-making has. He explains in lucid and provocative detail all the biases and heuristics that we are prone to; all the quirks and complexities that make the human species far different from the Homo Economicus of our textbooks. Overflowing with insights and endlessly fascinating, this book covers a wide range of topics and spans decades of pioneering work in the field of psychology. It begins by describing the basic ‘systems’ that govern human decision-making: the fast, intuitive, effortless and confident System 1, and the slow, deliberative, effortful, and indolent System 2. Kahneman then moves on to pointedly dis-assemble and dismiss rational choice theory by showing “the power of inconsequential factors as determinants of preference”. The last section of the book explores the contrasting ‘selves’ embodied in every individual: the remembering self and the experiencing self. The remembering self refers to the aspect in our nature that evaluates episodes by the lasting memory they leave; the one that keeps track of goals and keeps mental accounts; that answers the question: how satisfied are you with your life? The experiencing self is the aspect that feels every moment; that evaluates pleasure and pain on the go. Interestingly, these two selves are in conflict. The remembering self overweights the end of an episode and is indifferent to duration; it often promotes actions based on the memory that will result. Paradoxically, people may prefer an experience that is more painful in aggregate sum than another simply as a result of it ending on a less painful note. Considering that there is much interest in academic circles (including here at the LSE) in devising and using measures of subjective wellbeing to inform policy, the distinction between the selves is incredibly important. It gets at a fundamental philosophical question; what is happiness? Is it the pursuit of pleasure over pain? Or is it accomplishing one’s life-goals or some pre-conceived end? Kahneman concludes that both selves are necessary in evaluating subjective wellbeing, as both give us important information. Focusing exclusively on one or the other therefore excludes an important aspect of wellbeing. Considered the father of behavioural economics for good reason, Kahneman has had a prolific and hugely influential academic career. This book is a testament of the many contributions and collaborations he has been involved with in advancing the field. In this work, the author also seeks to stress the relevance of psychology in informing improved public policy. To use an example from the book, take the explosion of fear with regards to the chemical Alar, sprayed on apples to regulate their growth. The media sensationalized the story, leading to an exaggeration of the actual risk posed, and further fueling stories in the media. The public understandably applied pressure on politicians to address the risk, and they in turn obliged with an exaggerated response, banning the use of the chemical and costing farmers a fortune. In the end a small risk was blown totally out of proportion and “the net effect of the incident on public health was probably detrimental because fewer good apples were consumed”. Certainly, therefore, “psychology should inform the design of risk policies that combine the experts’ knowledge with the public’s emotions and intuitions”. Besides making the case for a greater role for psychology in public policy, Kahneman’s motivation in writing this book is for the wealth of knowledge about behaviour to become commonplace. In this endeavour he succeeds handily. As “the identification of judgment errors is a diagnostic task, which requires a precise vocabulary”, by simply becoming familiar with the terminology presented throughout the reader becomes equipped with an intuitive defense against common biases. When in a situation that screams “beware of the halo effect” or “you are overweighting low probabilities” or “what if this were framed differently”, the associative machinery within the brain (i.e. System 1) will spring the appropriate caution, and thus mistakes may be minimised.